Last week, 30 bottles of wine were delivered to the nascent Sanhedrin, setting in place one more necessary element for the Temple service – and one which is specifically mentioned in prophecy as a precursor to the Messiah. Grapes are one of the seven species in which Israel is especially blessed. But the fruit has more biblical significance than many realize. The return of grapes to Israel, notably absent during Islamic rule, when alcohol was prohibited, is prophesied by Micah to herald the coming of the Messiah. Wine is also integral to the Temple service. Though it is forbidden for priests to drink wine in the Temple, a wine libation was offered in the Temple every morning as part of the daily service. A quarter hin (approximately one quart) of wine was poured on the altar. 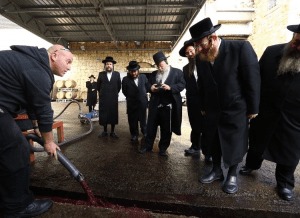 In preparation for the Third Temple, Rabbi Hillel Weiss, spokesman for the Sanhedrin, set out to find wine that is kosher for use in the Temple. Wine has special status in Judaism, as it is required for the Sabbath, holidays like Passover, and rituals like weddings and circumcisions. The requirements for wine to be considered kosher for everyday consumption are more stringent than for any food. The process, from crushing the grapes until bottling, must be performed entirely by Sabbath-observant Jews. The wine industry in Israel is flourishing, with hundreds of wineries producing over ten million bottles annually. But producing wine holy enough for the Temple has its own stringencies, and the vintage Rabbi Weiss sought could not be found in any store. First, Rabbi Weiss had to find a suitable vineyard. Normally, grape vines are grown above the ground, on wires suspended between frames. Grapes for use in Temple wine must be grown directly on the ground, a method not often used nowadays. But then Rabbi Weiss heard of a such a vineyard belonging to a pre-army high school in Yatir, south of Hebron. Moshe Hagger, the school’s principal, worked professionally in a winery before entering education and the high school keeps a vineyard for educational purposes. The modern state of Israel has led to the return of many of the Torah commandments connected with agriculture. During the shmittah (sabbatical) year, it is forbidden to work the land in any way. Some farmers rely on a loophole called Heter Mechirah, in which the land is symbolically sold to a non-Jew. 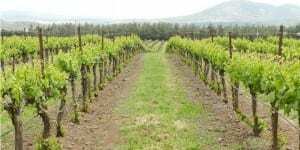 The small vineyard produced 60 bottles, 30 of which were acquired by Rabbi Weiss for the Sanhedrin. Rabbi Weiss opened one bottle and was amazed at the quality of the wine. “I had hoped the wine would be exceptional. Not only was wine an essential part of the Temple service, but ancient Israel was known for producing the best wine,” said Rabbi Weiss. the country, proof that wine was made in Israel thousands of years before it arrived in Europe. Last week, a special tithing observance, known as trumot u’maasrot, was held at the Psagot Winery in the Jerusalem Hills. Attended by rabbis and management of the highest kosher supervision, known as B’datz, thousands​ of​ liters of quality wine were spilled ​out. When the Temple is rebuilt, these tithes, along with other agricultural tithes, will be brought to the Temple. 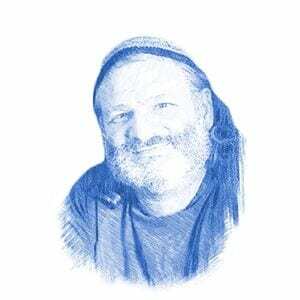 Rabbi Weiss believes that the rebirth of Israel’s wine industry is a sign of Messianic times.